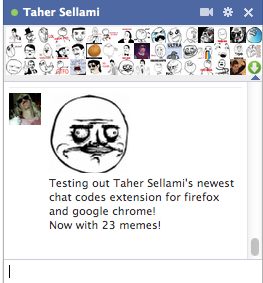 ← Animated pictures in the Facebook Chat! This entry was posted in Chat Codes and tagged chat, chrome, code, codes, emoticons, extension, facebook, firefox, google, google chrome, greasemonkey, Le Boss, sellami, small, smiley, smileys, source, sourcecode, taher, Taher Sellami, techez, turbolego, turbolego.com/L.txt, You Mad. Bookmark the permalink. 10 Responses to Facebook Meme Chat Emoticons Bar v3! Can you make me a LOL smily for Facebook? Can you make me a LOL smily for Facebook? PLS! Kindly pls. put the chat codes of those meme faces pls..
All the codes for this app are broken… tested it on Chrome. Please fix. pls make another link its broken i try it on mozilla,google,opera but its showing me problem loading page even my internet is fast!! !